The working strength of the Supreme Court has now gone upto 28 judges after today’s swearing in of 4 new judges. The number is just 3 short of the sanctioned strength of 31 SC judges. 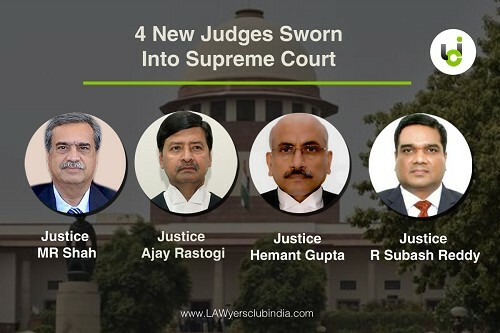 The central government had notified the appointments of Justices MR Shah, Ajay Rastogi, Hemant Gupta and R Subhash Reddy to the Supreme Court just yesterday in pursuance of the collegium recommendations made. Justice Hemant Gupta was the first to be sworn in today. Justice R Subhash Reddy was next, followed by Justice MR Shah and lastly, Justice Ajay Rastogi. Chief Justice Hemant Gupta was serving as the Chief Justice of the Madhya Pradesh High Court before his appointment to the Supreme Court. Justice Gupta enrolled as an advocate in July 1980. His areas of practice included Labour law, Company law, Constitutional law and Service law. He has served as an additional advocate general for Punjab between 1997 and 1999. He was appointed a judge of the Punjab and Haryana High Court in July 2002. He was thereafter transferred to the Patna High Court in February 2016. In October the same year, he was tasked as the Acting Chief Justice of the Patna High Court. In March 2017, he was appointed as the Chief Justice of the Madhya Pradesh High Court. Justice R Subhash Reddy was the Chief Justice of the Gujarat High Court prior to his appointment to the Supreme Court. Following his enrolment in 1980, Justice Reddy’s areas of practice included Civil, Criminal and Constitutional law. In December 2002, he was elevated as an additional judge of the Andhra Pradesh High Court. He was sworn in as a permanent judge of the High Court in 2004. In February 2016, he was elevated as the Chief Justice of the Gujarat High Court. Justice MR Shah, had been manning the Patna High Court, prior to his elevation to the Supreme Court. He had been transferred to the Patna High Court recently from the Gujarat High Court. Following his enrolment in 1982, Justice Shah practiced in the Gujarat High Court. He served as an additional standing counsel for the Central Government and has also appeared for the Central Bureau of Investigation. His practice including Constitutional law, central excise and customs law. He was appointed an additional judge of the Gujarat High Court in March 2004. The following year, his appointment was made permanent. In August this year, he was transferred to be appointed as the Chief Justice of the Patna High Court. Justice Ajay Rastogi served as the Chief Justice of Tripura High Court prior to his elevation to the Supreme Court. He enrolled at the Bar in March 1982 and practiced in the Rajasthan High Court. He became a judge of the Rajasthan High Court in September 2004. He also served as the acting Chief Justice of Rajasthan High Court for a month before he was appointed as Chief Justice of Tripura High Court.